Between 1485 and 1492 Cardinal Ascanio Sforza was the recipient of a music treatise composed for him by “Florentius Musicus” (Florentius de Faxolis), who had served him in Naples and Rome. Now in Milan, the richly illuminated small parchment codex bears witness to the musical interests of the cardinal, himself an avid singer taught by Duke Ercole d’Este. 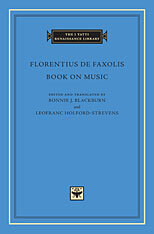 Florentius, whose treatise, found in no other source, is edited here for the first time, evidently took the cardinal’s predilections into account, for the Book on Music is unusual for its emphasis on “the praises, power, utility, necessity, and effect of music”: he devotes far more space to citations from classical and medieval authors than is the norm, and his elevated style shows that he aspires to appear as a humanist and not merely a technician. Likewise, the production quality of the manuscript indicates the acceptance of music’s place within the high culture of the Quattrocento. The author’s unusual insights into the musical thinking of his day are discussed in the ample commentary. 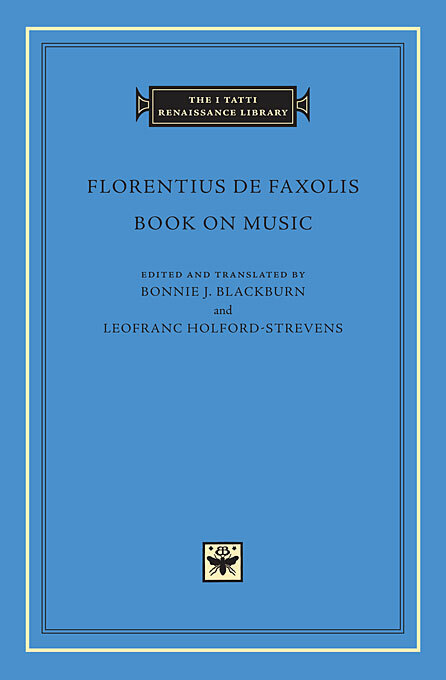 The editors, a Renaissance musicologist (Bonnie J. Blackburn) and a classical scholar (Leofranc Holford-Strevens), have combined their disciplines to pay close attention both to Florentius’s text and to his teachings.